Nokia's Communicators have come a long way as the latest addition to the series, the E90, arrives more than a year after the 9300i Communicator. The E90 packs virtually all the features there are available right now including HSDPA, Wi-Fi, built-in GPS, a 3.2-megapixel camera, large 800 x 352-pixel LCD (not touchscreen, though) and a full QWERTY keyboard. One of the biggest changes on the E90 from the earlier 9300i is the inclusion of a camera. Nokia explains the main reason for this is to capture a broader audience and also an increasing group of business execs who use their work phones after hours as well. 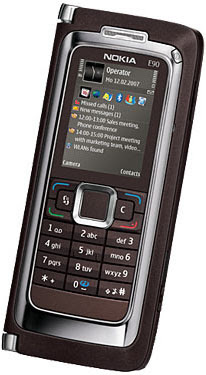 Unlike the 9300i which was based on the older S80 system, the E90 runs on the Symbian Series60 platform which has a more robust interface. Other business smart phones that are on the S60 operating system include the E61 and the E61i, both offering candy-bar form factors compared with the clamshell E90. When there's no need for the QWERTY keyboard, we can rely on the numeric keypad and a 2-inch QVGA screen on the top face. That, however, comes at a price. The E90 isn't the smallest or the lightest smart phone, but we feel its size and weight can be justified by those who want a portable computing device. Unlike the Dopod U1000 which is also in the mini computer category, we could still fit the E90 snugly into a pants pocket. The build quality is also excellent for this Nokia. However, the faceplate at the back of the E90 didn't gel very well at the top where the speakers are, but we're nitpicking and it could be just our review unit. When we're using the directional pad, delete and enter buttons on the QWERTY, we can feel its hollowness. On the outside, the E90 is like any other candy-bar phone. In fact, most of the functions are accessible from the 2-inch screen save for a front-facing camera for 3G video calls. The beauty of the E90 shows up only when we open the clamshell and let it sit on the table like a mini laptop. Accompanying a generous 4-inch 800 x 352-pixel LCD are numerous shortcut buttons for commonly used applications and also two customizable My Own keys for user-specific programs. A QCIF camera sits at the top left corner of this screen for video calls. The QWERTY keyboard is a joy to use although it is still impossible to type with two hands like on a full-size keyboard. Most times we simply used our thumbs or two index fingers to type. Unlike the E61i and the Dopod C730, the QWERTY on the E90 is considerably wider so our digits have to move across a longer horizontal distance. That could be tiring after a while. That said, the keys provide tactile feedback with a pitch of about 0.5mm (which may be enough for some, but not others). It would have been perfect if there was a more distinct feel between each button. A flaw with the earlier 9300i was that the keyboard didn't light up. Fortunately, this is corrected on the E90 with a dedicated button to adjust the brightness of the screen and also to light up the QWERTY keyboard. The keyboard lights up with a brightness level that's enough for us to know where each key is, yet isn't too glaring to distract us from the screen. One of the things we noticed during our review was the speed. 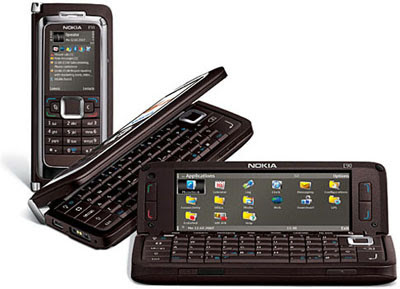 Opening applications and navigating the menus on this Nokia were a lot snappier compared with the previous 9300i. That's probably due to a fast 330MHz TI OMAP2420 processor and 128MB of RAM (about 80MB is free). Setting up the E90 to connect to our Exchange server was also a breeze. We used the Mail for Exchange program which can be downloaded for free from Nokia's Web site. The application allows us to sync our calendar, contacts and email on our server to the mobile device. There's also an option to set how often the synchronization should happen, although we left that to manual most of the time. The E90 also supports other popular messaging clients such as RIM's BlackBerry Connect and Intellisync Wireless Email. The other component of the Communicator which we were rather impressed with is the LCD. The screen is crystal-clear and text on it appears razor sharp. It also held up well under sunlight and has a wide viewing angle. Some similarities this Communicator has with the N95 are 3G, HSDPA, Wi-Fi connectivity and built-in GPS. Unfortunately, the E90 has the same issue as the N95. It took a much longer time for it to get a lock compared with the 6110 Navigator with assisted GPS. Click here to read a more in-depth description of the GPS navigation feature on the N95. Also, because the E90 uses a widescreen format, map display on the LCD is wider but requires the user to scroll vertically more often. For executives, the E90 comes preloaded with several useful programs such as Quickoffice (for document viewing and editing), a PDF reader and Team suite for contacts management. Other S60 applications will still work on the E90 although it won't be optimized for the widescreen format. According to Nokia, the user interface will need to be tweaked by the developers. Other features include FM radio, a music player, voice recorder, 128MB of onboard memory with a microSD expansion slot (a 512MB card is bundled), a 2.5mm audio jack (why no 3.5mm?) and Bluetooth stereo. There's also a 3.2-megapixel camera with LED photo light along with a pair of stereo speakers at the back of the device. For a handheld that has almost everything, we're a little disappointed it doesn't have a TV-out option. Another feature that's missing is the fax feature. Granted not everyone uses fax, but it's still something which is good to have especially on a business device. We tested the quadband (850/900/1800/1900MHz) E90 Communicator in Singapore with our M1 HSDPA SIM card. The 1,500mAh battery is rated for 5 hours of talktime and standby of 14 days. In our tests, it went through daily activities of texting and making phone calls, as well as connecting to our Exchange server two to three times each day to check emails and synchronize the smart phone. The battery lasted approximately three to four days before we had to reach for the charger. Voice quality was great both on the handset and via the speakerphone. The double-hinged design of the E90 props up the unit when it is on a table instead of lying flat which could muffle the audio. During video calls, the audio sounded a bit "noisy" but was generally fine and the image display was decent. Video and music playback were also gratifying. The fact that we could leave the phone on a table with the screen facing us at a comfortable viewing angle helped. We ran a 24bit 116MB WMV video file converted to the MP4 format on the E90. Overall experience was smooth but the video exhibited slight jaggy edges, though that's probably a result of the file conversion. Earlier this year at the launch of the E90, we had a chance to watch a better-quality clip on the unit and the result was fantastic. Nokia doesn't bundle any video file conversion software with the E90, so users will have to rely on apps found online. This being a camera-phone, would it meet expectations here? That unfortunately wasn't the case. It could be just our review unit but the shutter button behaved peculiarly. It didn't depress fully. In fact, only the right side of the key could be pressed. So you can imagine us trying to half-press to autofocus, but the button going down diagonally. Pressing the shutter also wouldn't activate the camera like most other camera-phones. The shooter has to be activated from the phone's menu. Alternatively, one can set a shortcut to the list of standby applications on the home screen. The autofocus mechanism was also a little iffy. It didn't achieve focus all the time even though there was clearly enough lighting. There were even times it lost its lock after achieving focus. Picture quality, on the other hand, was decent, though colors seemed a little washed-out and white balance tended to be on the cool side resulting in a slight blue tinge in some of our snaps. Night pictures, like many other camera-phones, weren't impressive. On the E90 without the photo light, our pictures were marred by blue blotches. It's clear that the E90 Communicator isn't for everyone. The question you need to ask yourself before buying this Nokia is whether you really need it. For us, even with a very strong feature set including HSDPA, Wi-Fi and GPS, the idea of carrying a "mini-laptop" everywhere isn't our cup of tea. Sometimes we wished we had a more compact phone instead. In the event that you are looking for a truly smart device, then in terms of features, the E90 really doesn't have a lot of competition. There's the Dopod U1000, but that's bigger, heavier, more expensive and isn't the most ideal cross between a mobile phone and a computing device. There are more compact alternatives such as Nokia's own E61/E61i or the Dopod C500 and C730, but each of these smart phones has its strengths and weaknesses. The E90 is almost perfect in some ways but imaging is not one of them, though we'd say the addition of a camera is a plus. We think Nokia has achieved a feat here by packing nearly all the features that are available right now into a reasonably compact smart phone.